This outdoor welcome sign has a bee design and is ideal for greeting visitors to nurseries, pre-schools and schools. It includes a fully weatherproof notice board which is designed for use outside and can be used to display information and notices. 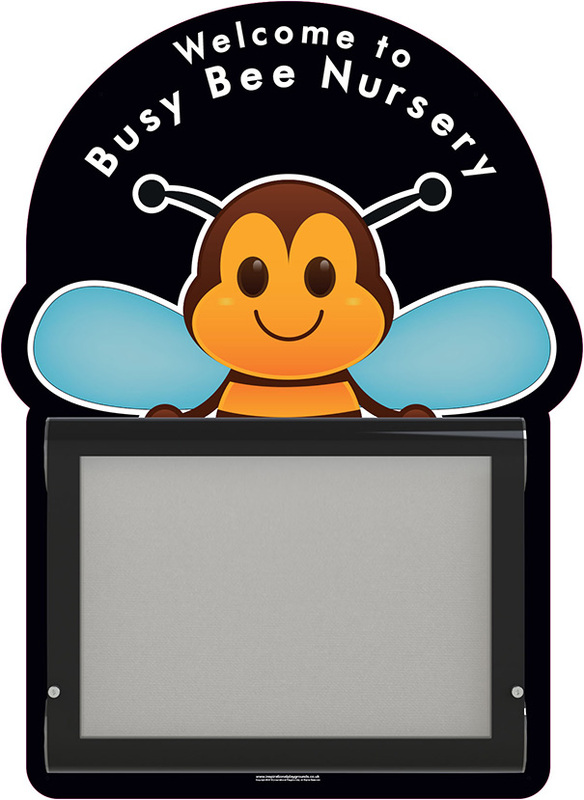 The back board is made from a heavy duty, rigid plastic panel which is printed with the bee design and your own choice of welcome message. A maximum of 30 characters can be printed. The graphic is UV light and weather resistant so will last well outside. In front of the printed back board is a weathershield external notice board which has a double sealed door and fully enclosed case so the contents inside are protected from the elements outside. It complies with IP55 test for dust and water ingress. The notice board door is glazed with virtually shatterproof polycarbonate which is fire rated. The door is hinged along the top edge and opens to a 90o angle to allow easy access to the information inside. The door is also lockable so you can keep notices safe. The outdoor notice board has an aluminium frame, finished in black, with a grey felt interior which is suitable for pins. It is fixed in a landscape position and will hold up to four A4 sheets in landscape orientation. The notice board core and fabric covering are fire rated to Class 0. Please note: the noticeboard included has black frame and grey felt interior. Images of grey/blue noticeboard are for product illustration purposes only.